16 March 2017 : Orange Pi maker Shenzhen Xunlong Software Co. Ltd is launching an app store in partnership with Canonical to foster an active community of developers and users. Through this app store, developers gain a simple mechanism to share their applications, projects and scripts between themselves and with the wider Orange Pi community. Applications in the store are formatted as snaps, the universal Linux application packaging format. With snaps developers can distribute their application in a secure, confined package bundled with all its dependencies, so users can install applications that could take half an hour to install in just a few seconds. 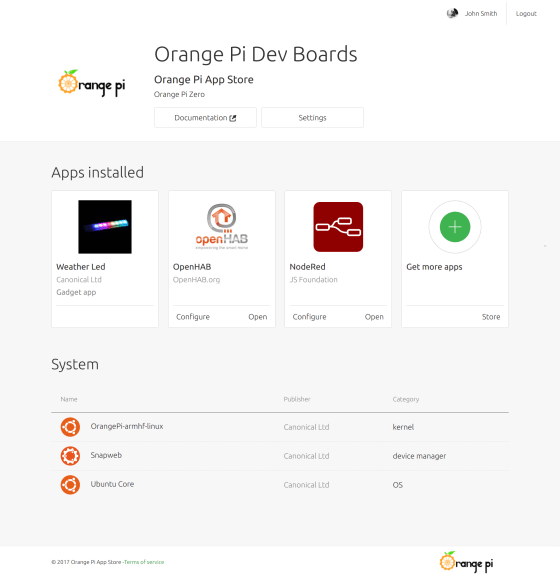 The Orange Pi App Store uses the whitelabel app store offering from Canonical, which lets them distribute applications to the Orange Pi community under its own brand. The store is a place for developers to share their Orange Pi specific applications. It also benefits from the wealth of applications available in the Ubuntu snap store, also available through the store. The community has already contributed 100s of snaps in the Ubuntu snap store, ranging from server to desktop and IoT applications, thus matching the variety of use cases for the Orange Pi family of boards. While creating an active developer community around Orange Pi, the store and snaps are also key to supporting device makers throughout their project lifecycle. “This new app store is much more than an easy way for Orange Pi owners to find and install great applications. Orange Pi is a powerful set of tools for developers enabling them to go much faster from development to production with CI integration, cross-platform building and beta distribution. As long as you have dreams, we could assist you to realise it in our way” said Steven Zhao, the CEO of Xunlong. A number of vertical applications are available that can also accelerate the development of IoT projects such as openHAB for home IoT usage, Rocket.chat or NextCloud for SMEs or wifi-ap for networking. The Orange Pi is based on a quad-core 32/64 bit ARM Cortex A7/A53 Allwinner SoC. It is available in several models from the entry level Orange Pi Zero to the 2Gb of RAM Orange Pi Plus 2. This variety means device manufacturers can choose the most appropriate board for their device while benefiting from software and hardware compatibility at development time.